Welcome to the Michael Strong Black and White Blog Hop! 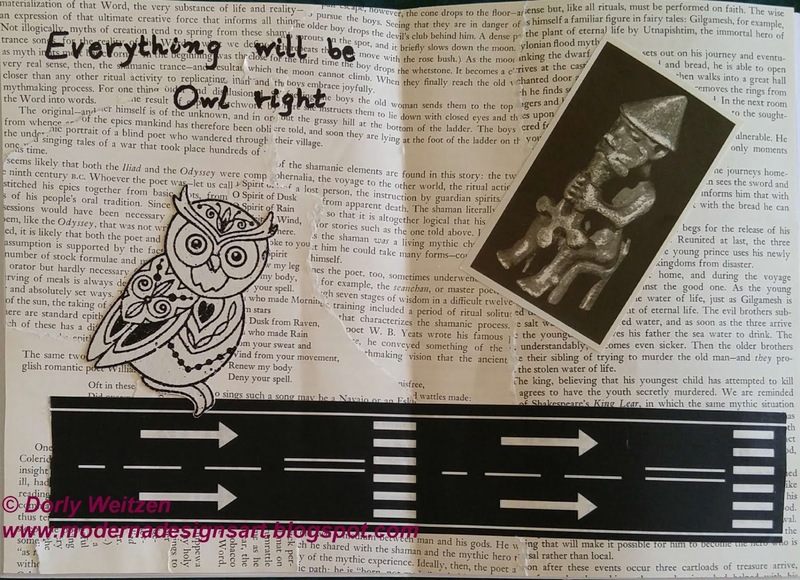 My project is a double spread journaling page, in a regular sized notebook (A5). 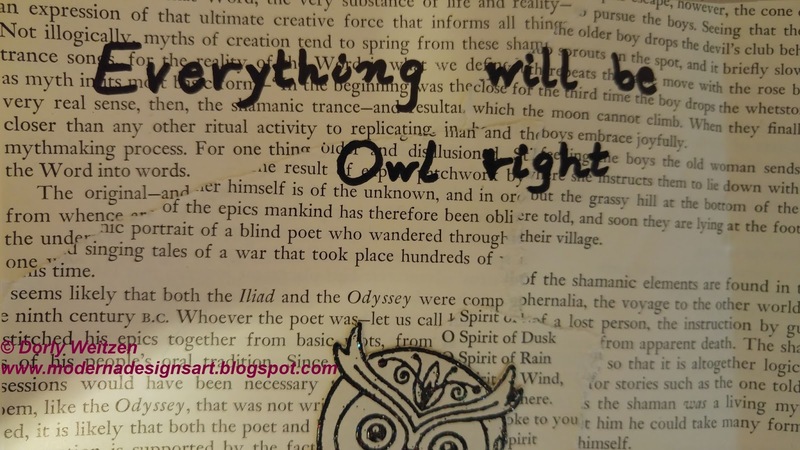 For the background, I used a collage of randomly torn pages from a Mythology book which I saved from being thrown away – I upcycled it for a good purpose. I also used a photo from the same book, showing a figure which seems to say "It'll be OK", very confidently. 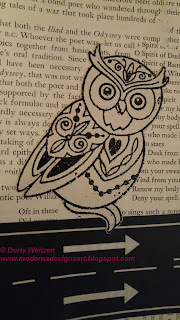 I used Mike's Whimsical Owl stamp, heat embossed with an extra sparkly and shiny black EP, hand cut with scissors. The Washi Tape at the bottom of the page is actually a rather wide fabric tape. It's directing the way to a one-way-ticket destination, leading to a positive and optimistic ending of the road, which goes along with the Sentiment. The hand-written Sentiment is a very optimistic one. Please notice: if leave a comment in Mike’s blog, you may be lucky and win some blog candy stamps. I missed blogging, and I'm glad to be back. Good to see your blog is working now Dorly. 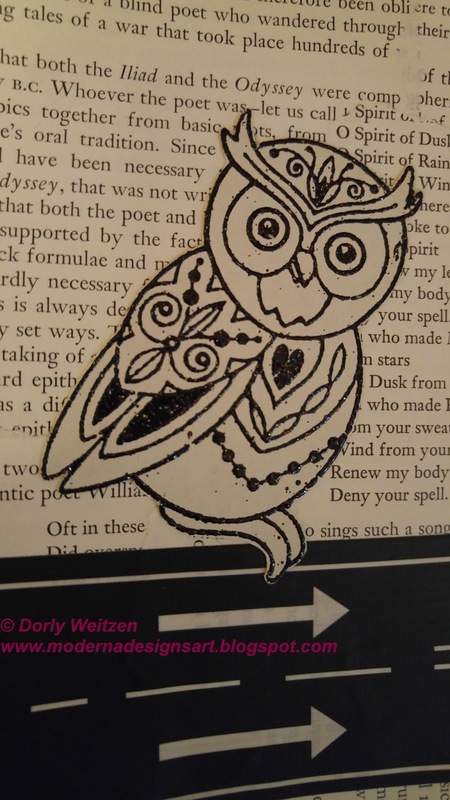 A very interesting page you have made with the owl stamp. What a fun journal layout, Dorly. 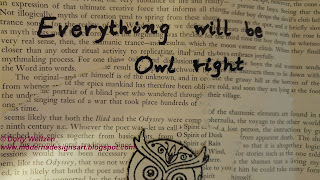 Great theme and cute play on the word, owl! Thanks for sharing your creativity! What a fun way to use the owl. I like the fabric tape at the end. Thanks for sharing. Interesting work of textures created by the density of the texts of the book pages and the hand writing. The other elements suggesting open code to let each observer find his own interpretation. I like it, Dorly. Love the owl! I also love the concept for the journally. TFS. So creative! Love your cute owl. 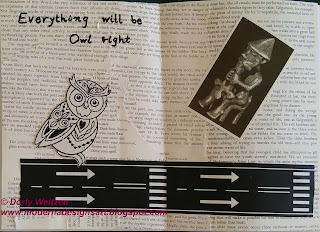 Very creative - love the owl for your journaling page !